1. What are the Councilmembers’ phone numbers, fax numbers, and mailing addresses? Please view the councilmember page. 2. Which Councilmember has been elected from my residency area? 3. Who chairs the council’s committees? 4. Which councilmember should I contact to voice my concerns? Although they are subject to district residency requirements, councilmembers are elected “at large” by the voters of the county. Therefore, concerns may be voiced to any councilmember. Oral and written testimonies are accepted on any agenda item. Because procedures vary slightly from one Committee to another, please contact the appropriate Committee staff for details or refer to the Committee’s agenda for instructions. 8. How do I submit testimony if I can’t be there in person? For Committee meetings, 16 copies are requested to be submitted to the appropriate Committee staff so copies can be distributed to the Members in a timely manner. For Council meetings, 15 copies are requested to be submitted to the County Clerk’s staff. If written testimony is e-mailed or faxed, please submit at least 24 hours before the meeting so that copies can be provided to Council members in a timely manner. You may subscribe to the agendas by visiting MauiCounty.us/agendas. 13. Where are the councilmembers’ offices located? The Council Chair’s office is located on the 7th floor of the Kalana O Maui (County) building; the other councilmembers’ offices are located on the 8th floor. 15. What’s on the Council meeting agenda? 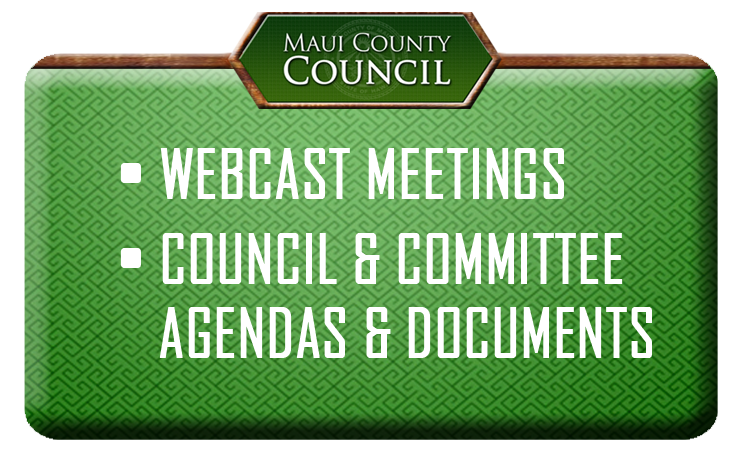 Please visit MauiCounty.us/agendas for upcoming agendas. 16. What’s on the Committee meeting agenda? Please visit MauiCounty.us/agendas and select the committee name you wish to learn more about. Please contact the Office of the County Clerk at (808) 270-7748. A bill is a draft of a proposed law presented for approval to a legislative body. Generally, bills are referred to one of the standing Council Committees. Please contact the Office of Council Services at (808) 270-7838 for the specific Committee information. An ordinance is a law or regulation enacted by the County. Ordinances from 1999 can be viewed by visiting the “Ordinances” link here. The Maui County Code is the codified collection of ordinances. Please contact the Office of the County Clerk at 808-270-7748 for copies of these documents in final form or by visiting the “Resolutions” link here. Drafts may be obtained from the originating department. 24. How do I contact/call Councilmembers if I live on Lana`i? 25. How do I contact/call Councilmembers if I live on Moloka`i? 27. What are the Council’s official social media accounts? 28. Does the Council have a social media policy? 29. Does the Council have a communication plan? 29. What is the Chair’s 3 Minutes? “Chair’s 3 Minutes” is a weekly column to explain the latest news on county legislative matters. Go to MauiCounty.us for more information. Review past articles here.